For the lakes in Ireland, see Lough Derg. For the village in Iran, see Derg, Iran. For the city in India, see Durg. The Derg (Ge'ez: ደርግ, "committee" or "council"), officially the Provisional Military Government of Socialist Ethiopia, was the military junta that ruled Ethiopia from 1974 to 1987. The Derg was established in June 1974 as the Coordinating Committee of the Armed Forces, Police and Territorial Army by low-ranking officers of the Ethiopian Army and police led by Chairman Aman Andom. The Derg was formally renamed the Provisional Military Administrative Council and in September 1974 overthrew the government of the Ethiopian Empire and Emperor Haile Selassie I during mass protests. The Derg abolished the monarchy and embraced communism as an ideology, establishing Ethiopia as a Marxist-Leninist one-party state with itself as the vanguard party in a provisional government. The abolition of feudalism, increased literacy, nationalization, and sweeping land reform including the resettlement and villagization from the Ethiopian Highlands became priorities. Mengistu Haile Mariam became Chairman in 1977, launching the Qey Shibir to eliminate political opponents, with tens of thousands imprisoned and executed without trial. By the mid-1980s, Ethiopia was ravaged by various issues such as droughts, economic decline, the 1983–1985 famine, increasing reliance on foreign aid, mismanagement, corruption, the after-effects of failed Derg policies, the Eritrean War of Independence, and the Ethiopian Civil War between the Derg and United States-backed ethnic militias. 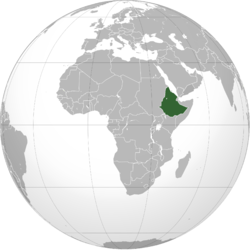 In 1987, Mengistu abolished the Derg and formed the People's Democratic Republic of Ethiopia led by the Workers' Party of Ethiopia, with a new government dominated by surviving members of the Derg. The brutal military dictatorship of the Derg is estimated to be responsible for the deaths of up to 2 million Ethiopians. After the February 1974 popular revolution, the first signal of any mass uprising was the actions of the soldiers of the 4th Brigade of the 4th Army Division in Nagelle in southern Ethiopia. They were unhappy about the state of their food and water and arrested their brigade commander and other officers. When the government sent the commander of the ground forces, General Deresse Dubala to treat with the rebels, they held him and forced him to eat their food and drink their water. Similar mutinies took place at the air force base at Debre Zeit, on 12 February, and at Second Division at Asmara on 25 February. It was these protests that gave rise to a general armed forces uprising. The coordinating committee of the armed forces, police and territorial army, or Derg was officially announced 28 June 1974 by a group of military officers. This was done in order to maintain law and order, due to the powerlessness of the civilian government following widespread mutiny in the armed forces of Ethiopia earlier that year. Its members were not directly involved in those mutinies nor was this the first military committee organized to support the administration of Prime Minister Endelkachew Makonnen. Alem Zewde Tessema had established the armed forces coordinated committee on 23 March. Over the following months, radicals in the Ethiopian military came to believe Makonnen was acting on behalf of the hated feudal aristocracy. When a group of notables petitioned for the release of a number of government ministers and officials who were under arrest for corruption and other crimes, three days later Derg was announced. Derg, which originally consisted of soldiers at the capital, broadened its membership by including representatives from the 40 units of the Ethiopian Army, Air Force, Navy, Kebur Zabagna (Imperial Guard), Territorial Army and police: each unit was expected to send three representatives, who were supposed to be privates, NCOs and junior officers up to the rank of major. According to Bahru Zewde, "Senior officers were deemed too compromised by close association to the regime." The Derg was reported to consist of 120 soldiers, a statement which has gained wide acceptance due to the habitual secretiveness of the Derg in its early years. But, Bahru Zewde notes that "in actual fact, their number was less than 110", and Aregawi Berhe mentions two different sources which record 109 persons as being members of the Derg. No new members were ever admitted, and the number decreased, especially in the first few years, as some members were expelled or killed. They assembled at the Fourth Division headquarters. The committee elected Major Mengistu Haile Mariam as its chairman and Major Atnafu Abate as its vice-chairman. The Derg was initially supposed to study the grievances of various military units, investigate abuses by senior officers and staff and to root out corruption in the military. In the months following its founding, Derg steadily accrued more power. In July, Derg obtained key concessions from the emperor, Haile Selassie, which included the power to arrest not only military officers, but government officials at every level. Soon both former Prime Ministers Tsehafi Taezaz Aklilu Habte-Wold and Endelkachew Makonnen, along with most of their cabinets, most regional governors, many senior military officers and officials of the Imperial court were imprisoned. In August, after a proposed constitution creating a constitutional monarchy was presented to the emperor, Derg began a program of dismantling the imperial government in order to forestall further developments in that direction. Derg deposed and imprisoned the emperor on 12 September 1974. On 15 September, the committee renamed itself as the Provisional Military Administrative Council (PMAC) and took control of the government. The Derg chose Lieutenant General Aman Andom, a popular military leader and a Sandhurst graduate, to be its chairman and acting head-of-state. This was pending the return of Crown Prince Asfaw Wossen from medical treatment in Europe, when he would assume the throne as a constitutional monarch. However, General Aman Andom quarreled with the radical elements in the Derg over the issue of a new military offensive in Eritrea and their proposal to execute the high officials of Selassie's former government. After eliminating units loyal to him — the Engineers, the Imperial Bodyguard and the Air Force — the Derg removed General Aman from power and executed him on November 23, 1974, along with some supporters and 60 officials of the previous Imperial government. Brigadier General Tafari Benti became both the new Chairman of Derg and head of state, with Mengistu and Atnafu Abate as his two vice-Chairmen, both with promotions to the rank of Lieutenant-Colonels. The monarchy was formally abolished in May 1975, and Marxism-Leninism was proclaimed the ideology of the state. Emperor Haile Selassie died on 22 August 1975, while his personal physician was absent. It is commonly believed that Mengistu killed him, either ordering it done or by his own hand. After internal conflicts that resulted in the execution of General Tafari Benti and several of his supporters in February 1977, and the execution of Colonel Atnafu Abate in November 1977, Mengistu gained undisputed leadership of the Derg. In 1987, he formally dissolved the Derg and established the country as the People's Democratic Republic of Ethiopia (PDRE) under a new constitution. Many of the Derg members remained in key government posts and also served as the members of the Central Committee and the Politburo of the Workers' Party of Ethiopia (WPE). This became Ethiopia's civilian version of the Eastern bloc communist parties. Mengistu became Secretary General of the WPE and President of the PDRE, while remaining Commander in Chief of the Armed Forces. Derg party badge, c. 1979. Opposition to the reign of the Derg was the cause of the Ethiopian Civil War. This conflict began as extralegal violence between 1975 and 1977, known as the Red Terror, when the Derg struggled for authority, first with various opposition groups, then with a variety of groups jockeying for the role of vanguard party. Though human rights violations were committed by both sides, the great majority of abuses against civilians as well as actions leading to devastating famine were committed by the government. Once the Derg had gained victory over these groups and successfully fought off an invasion from Somalia in 1977, it engaged in a brutal war against armed opponents. These groups included guerrillas fighting for Eritrean independence, rebels based in Tigray (which included the nascent Tigrayan Peoples' Liberation Front) and other groups that ranged from the conservative and pro-monarchy Ethiopian Democratic Union to the far leftist Ethiopian People's Revolutionary Party. Under the Derg, Ethiopia became the Soviet bloc's closest ally in Africa and became among the best armed nations of the region as a result of massive military aid, chiefly from the Soviet Union, East Germany, Cuba and North Korea. During a massive demonstration in Addis Ababa immediately following the announcement, a group of students broke through police and army barriers, climbed the wall and escarpment around Menelik Palace, and embraced major Mengistu as the hero of the reform. In addition, Derg in 1975 nationalized most industries and private and somewhat secure urban real-estate holdings. But mismanagement, corruption and general hostility to the Derg's violent rule, coupled with the draining effects of constant warfare with the separatist guerrilla movements in Eritrea and Tigray, led to a drastic fall in general productivity of food and cash crops. In October 1978, Derg announced the National Revolutionary Development Campaign to mobilize human and material resources to transform the economy, which led to a ten-year plan (1984/85 - 1993/94) to expand agricultural and industrial output, forecasting a 6.5% growth in GDP and a 3.6% rise in per capita income. Instead, per capita income declined 0.8% over this period. Famine scholar Alex de Waal observes that while the famine that struck the country in the mid-1980s is usually ascribed to drought, closer investigation shows that widespread drought occurred only some months after the famine was already under way. Hundreds of thousands fled economic misery, conscription and political repression and went to live in neighboring countries and all over the Western world, creating an Ethiopian diaspora for the first time. The famine in the mid-1980s brought the political situation in Ethiopia to the attention of the world and inspired charitable drives in Western nations, notably by Oxfam and the Live Aid concerts of July 1985. The money they raised was distributed among NGOs in Ethiopia. A controversy arose when it was found that some of these NGOs were under Derg control or influence and that some Oxfam and Live Aid money had been used to fund Derg's enforced resettlement programmes, under which they displaced millions of people and killed between 50,000 and 100,000. A BBC investigation reported that rebels had used millions of pounds of aid to buy arms; these accusations were later fully retracted by the corporation. Although the Derg government officially came to an end 22 February 1987, three weeks after a referendum approved the constitution for the PDRE, it was not until that September the new government was fully in place and the Derg formally abolished. The surviving members of the Derg, including Mengistu, remained in power as the leaders of the new civilian regime. The geopolitical situations turned unfavourable for the communist government in the late 1980s, with the Soviet Union retreating from the expansion of Communism under Mikhail Gorbachev's glasnost and perestroika. Socialist bloc countries drastically reduced their aid to Ethiopia, struggling to keep their own economies going. This resulted in even more economic hardship, and the military gave way in the face of determined onslaughts by guerrilla forces in the north. The Soviet Union stopped aiding the PDRE altogether in December 1990. Together with the fall of Communism in the Eastern Bloc in the Revolutions of 1989, this was a serious blow to the PDRE. Towards the end of January 1991, a coalition of rebel forces, the Ethiopian People's Revolutionary Democratic Front (EPRDF) captured Gondar (the ancient capital city), Bahir Dar and Dessie. Meanwhile, the Eritrean People's Liberation Front had gained control of all of Eritrea except for Asmara and Assab in the south. The Soviet Union, mired in its internal turmoil, could no longer prop up the Derg. In the words of the former US diplomat Paul B. Henze, "As his doom became imminent, Mengistu alternated between vowing resistance to the end and hinting that he might follow Emperor Tewodros's example and commit suicide." His actions were frantic: he convened the Shengo, the Ethiopian Parliament, for an emergency session and reorganized his cabinet, but as Henze concludes, "these shifts came too late to be effective." On 21 May, claiming that he was going to inspect troops at a base in southern Ethiopia, Mengistu slipped out of the country to Kenya. From there he flew with his immediate family to Zimbabwe, where he was granted asylum and as of 2010[update] still resides. Upon entering Addis Ababa, the EPRDF immediately disbanded the WPE and arrested almost all of the prominent Derg officials shortly after. In December 2006, seventy-three officials of Derg were found guilty of genocide. Thirty-four people were in court, fourteen others had died during the lengthy process, and twenty-five, including Mengistu, were tried in absentia. The trial ended 26 May 2008, and many of the officials were sentenced to death. In December 2010, the Ethiopian government commuted the death sentence of 23 Derg officials. On 4 October 2011, 16 former Derg officials were freed, after twenty years of incarceration. The Ethiopian government paroled almost all of those Derg officials who had been imprisoned for 20 years. Other Derg ex-officials managed to escape, and organized rebel groups to overthow Ethiopia's new government. One of these groups is the Ethiopian Unity Patriots Front which waged an insurgency in the Gambela Region from 1993 to 2012. ^ "Dawit Wolde Giorgis, "Red Tears: War, Famine, and Revolution in Ethiopia"". ^ Fitzgerald, Tyrant for the taking in White, Matthew (2011). Atrocitology. Edinburgh: Canongate. p. 615. Retrieved 2013-03-21. ^ Rapoport, Knives Are Out in White, Matthew (2011). Atrocitology. Edinburgh: Canongate. p. 615. Retrieved 2013-03-21. ^ See, for example, Richard Pankhurst, The Ethiopians: A History (Oxford: Blackwell, 2001), p. 269. ^ Wrong, Michela (2005). I didn't do it for you. Harper Collins. p. 244. ISBN 0-06-078092-4. ^ Bahru Zewde 2001, 237f. ^ de Waal 1991, iv. ^ Bahru Zewde 2001, 262f. ^ de Waal 1991, 4. ^ David Rieff (24 June 2005). "Cruel to be kind?". The Guardian. Retrieved 9 October 2011. ^ BBC Complaints (17 November 2010). "ECU Ruling: Claims that aid intended for famine relief in Ethiopia had been diverted to buy arms". BBC. Retrieved 9 October 2011. Following a complaint . . . the BBC has investigated these statements and concluded that there was no evidence for them . . . The BBC wishes to apologise unreservedly . ^ This article incorporates public domain material from the Library of Congress document: Edmond J. Keller (1991). Thomas P. Ofcansky and LaVerle Berry (ed.). "Ethiopia: A country study". Federal Research Division. The 1987 Constitution. ^ a b Henze 2000, 327f. ^ Gagnon, Clough & Ross (2005), pp. 8–9. ^ "Ethiopian rebels leave South Sudan as peace initiative fails". Sudan Tribune. 23 June 2009. Retrieved 22 March 2019. ^ "Ethiopian Rebels Deny Taking Side in South Sudan Conflict!". Nyamile. 25 October 2014. Retrieved 25 January 2019. Bahru Zewde. 2001. A History of Modern Ethiopia (second edition). London: James Currey. de Waal, Alex (1991). Evil Days: Thirty Years of War and Famine in Ethiopia. New York & London: Human Rights Watch. ISBN 1-56432-038-3.
de Waal, Alex (2002) . Famine Crimes: Politics & the Disaster Relief Industry in Africa. Oxford: James Currey. ISBN 0-85255-810-4. Gagnon, Georgette; Clough, Michael; Ross, James, eds. (March 2005). "Targeting the Anuak: Human Rights Violations and Crimes Against Humanity in Ethiopia's Gambella Region" (PDF). Human Rights Watch. 17 (3 (A)).